The 2018-2019 swim team opened its season this past weekend competing against 13 other schools at the 6th Annual Atlanta Kickoff Classic. Led by senior team captains Carter Frooman, Charlie Kaye and Sophia Lochan, both the girls and boys put up impressive swims early in the season. The AquaKnights didn't disappoint, with eight qualifications for the state championship in this first meet. The girls medley relay of senior Luisa Whitney, junior Erin Hood, and sophomores Lizzy Kaye and Amalie Little finished first with a state-championship qualifying time. 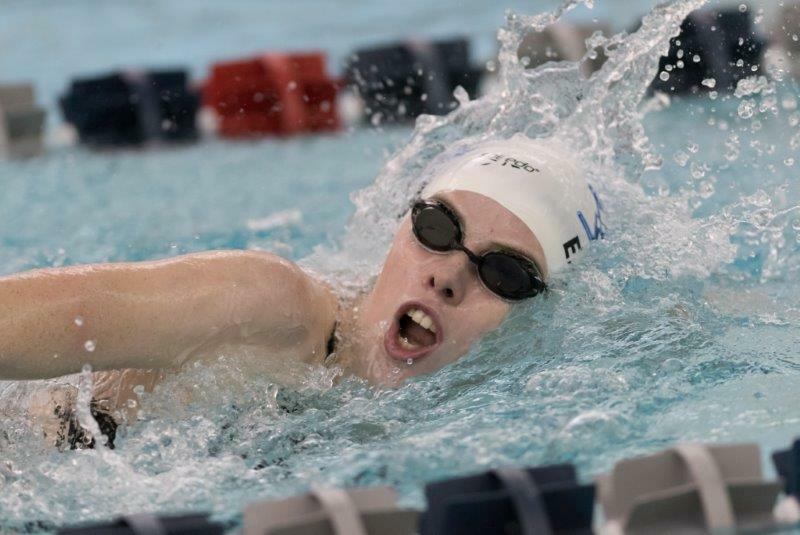 Hood went on to make three individual state-championship cuts with first-place finishes in the 200 freestyle, 100 breaststroke and 50-yard swim in the 200 freestyle relay. The girls 200 freestyle relay team of Hood, Whitney, Kaye and sophomore Isabel Battista finished third with a state-qualifying time. Other top finishers for the girls were Kaye finishing fourth in both the 50 freestyle and the 100 backstroke. Battista took seventh in 200 free, with Whitney finishing eighth. Freshman Leah Favero finished 10th in the 200 IM. Sophomore Maggie Jenkins placed seventh in the 50 free, while freshman Holland Proctor was fifth in the 100 free and ninth in the 100 back. Little also took home seventh in the 100 fly and eighth in the 100 back. The girls finished up the day with a fourth-place finish in the 400 freestyle relay, swum by Little, Proctor, Battista and Lochan. The girls team finished in fifth place overall. For the boys, Charlie Kaye started his senior season with three state-championship qualifying times—in the 50 freestyle, 100 butterfly and 100 freestyle. Other notable finishes for the boys were the medley relay team of Kaye, Frooman, junior John O'Brien and sophomore Henry Berman finishing eighth. Kaye took third in the 50 free and second in the 100 butterfly. Berman also placed 10th in the 200 IM and ninth in the 100 back. The boys 400-yard freestyle relay team of Kaye, Berman, O'Brien and junior Dillon Carroll finished the day with a fourth-place finish. The boys team finished seventh overall. The next meet will be Thursday, Nov. 15, at home against Loganville. 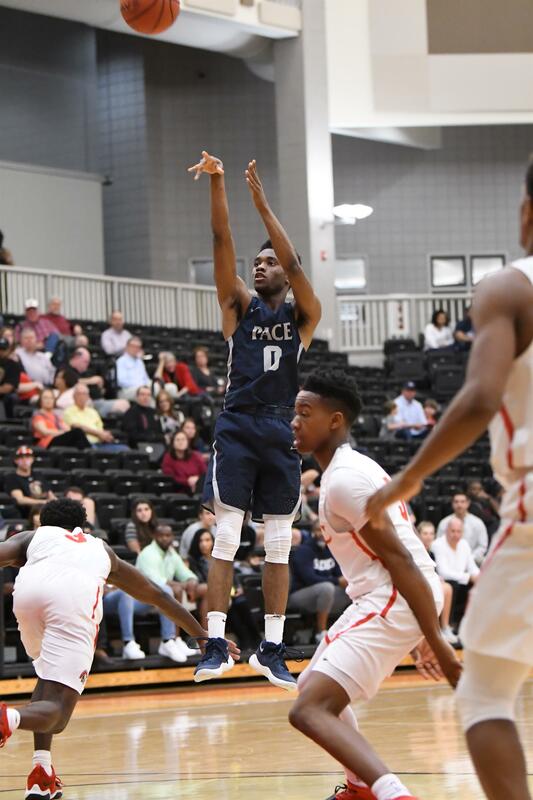 Pace hoops is off and running in a new season with a new, energized coaching staff. 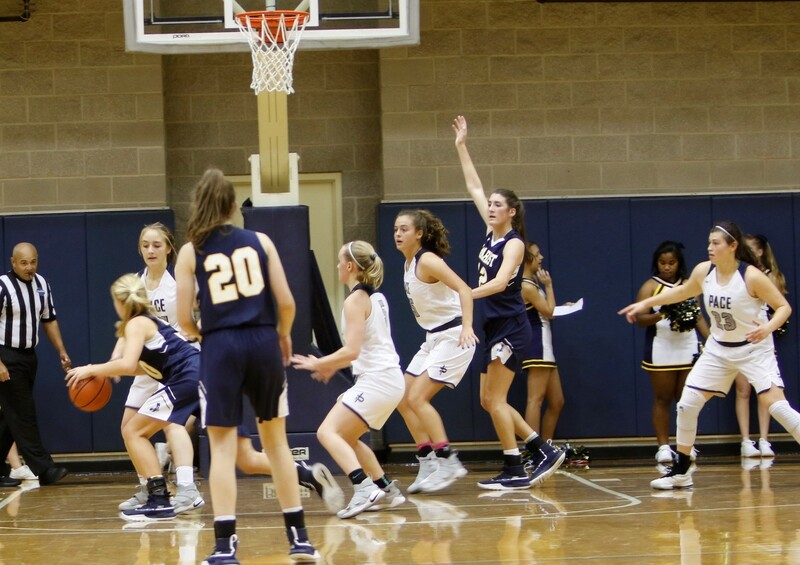 The Knights took on the Marist School on Saturday, Nov. 10, in what Coach Sharman White called a "gritty team win." The Knights defeated the Marist War Eagles 56-44 in their first league game of the season. The Knights were led in scoring by senior Myles Todd, who exploded with 31 points, 7 rebounds and swiped 6 steals. Sophomore Cole Middleton also put in a strong effort with 13 rebounds, 3 blocks and 9 points. Sophomore Josh Mininberg was solid at the free-throw line, shooting 6-6 for the night. Earlier in the week, on Wednesday, Nov. 7, the Knights tuned up with a scrimmage game against Collins Hill High School, winning 71-54. In this game, Middleton scored 27 points, grabbed 14 rebounds and 6 blocks. Todd also added 20 points in the effort. The Knights' next game: Hoops 4 A Cure tournament against Creekview High School at the St. Francis School in Alpharetta at 4:15 p.m. on Saturday, Nov. 17. The Pace Academy varsity girls basketball team lost Saturday's home non-conference game against the Marist War Eagles by a score of 41-32. Junior Virginia Hobbs led the way on the boards, hauling in 7 rebounds. Senior Joelle Zelony finished with 9 points, 6 assists and 2 steals. Although it was a tough shooting night, the team showed signs of a promising season, particularly on the defensive side of the ball. The Knights' next games: Tuesday, Nov. 13, at 5:30 p.m. in the Inman Center versus the Wesleyan School and Saturday, Nov. 17 at North Forsyth High School. Sign-up for a volunteer shift during either Girls or Boys Varsity basketball home games. It is a super way to meet and interact with others in the Pace community, show your support for Pace Athletics, and fill a very important need. You can sign-up by logging into myPACE and selecting BOOSTER CLUB under the PARENT VOLUNTEER section.